Also I went to go see Frozen in theaters. I really enjoyed it though found a few comedic scenes in the middle of drama to be off putting. I surprisingly did not hate the snow man. Of course the big thing for me going in was Elsa as a character with queer subtext. Now I know what you are going to say, "Nicole, why are you always going on about the Queerios?" Well A) Representation matters and B) Hey thats my word, who said you could use it? Well we don't know. She canonically has no sexuality expressed. The fact alone she is a ruler with no love interest gets pointed to as evidence to her being a lesbian but that is pretty weak. The Subtext or Have You Ever Tried Not Being a Mutant? Elsa's powers are similar to the X-Men in that they can be used as metaphor for being queer. You are born different, people potentially hate and fear you, you often conceal it and there can be a coming out process, you can potentially destroy nations... Okay the metaphor isn't perfect. A mantra that Elsa learns from her perhaps well meaning but misguided parents is "Conceal, Don't Feel". Conceal her powers by controlling her emotions and hiding them away as the two are tied together. That works pretty great as a closet metaphor actually. You can't express your real self because of what might happen. In the end it is through acceptance of herself and by embracing love that Elsa finds the key to her happiness. 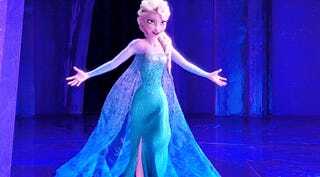 Elsa flees her home and sings a song as she comes to terms with her powers and finds a freedom she didn't have before. Queer people often become isolate from their families and community especially after a bad coming out, and Elsa definitely had a bad one. It can be both devastating as well as empowering as you begin living a life without the burden of those concerns. You no longer have to be the "Perfect girl" like Elsa puts it. Elsa strips away the trappings of that world to immerse herself in the identity she had to hide. There is a lot of controversy to the idea of a queer character in a kids film. No matter how much heterosexual romance and kissing is in kids media, the exact same thing but with a gay couple would be considered inappropriate. Queer people are oversexualized by cis heterosexuals to be inappropriate. And that is why if they even wanted Elsa to be lesbian or bisexual, it wasn't going to happen without Disney taking a big leap. But while she isn't canonically queer, she also isn't straight and to assume she must be would be heterosexism. I like to think all the aforementioned reasons hint to her being queer but really it is about personal bias. What we do need is a queer character that isn't just subtext. As I said representation matters. These films being aimed at children are often a big reason why people are against queer characters in them but I would say it is all the more reason to have them. Queer identities don't just magically form as you turn 18. Like Elsa they can be things kids grow up with even if they do not fully understand them. And like Elsa it can be something they can be taught to hate and fear that part of themselves which can cause issues well into adulthood. I would rather both Elsa and children learn to accept and understand the differences inside of them so they can live happier lives as themselves. And don't destroy their home nation.